Our New Line Of Unique Baby Gifts Will Make A Statement! We know creative and one of a kind baby gifts are hard to find. 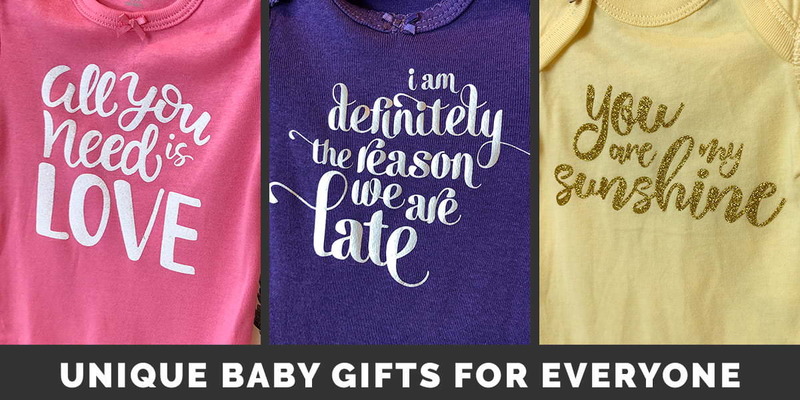 We solved the problem for you and have created a unique line of hilarious and sweet (sassy and chic) wearable baby gifts that are sure to bring smiles to anyone who sees them. Make sure you order a few so the baby wearing these artistic expressions will make other people smile and laugh as they grow. Who are sass&chic products for? You and your baby. A gift for a new baby. A gift for someone who has a baby on the way. Friends and family looking to buy unique and creative baby gifts. Or, you are any/all of the above and simply want to give a gift that makes a statement. We’ve been hard at work to create a variety of sassy and chic designs appealing to your sense of humor and love. We are confident you will love looking though our sassy baby and chic baby designs. You will have to share the experience with your friends because everything is made for all types of people. Our collections include amazing baby gift ideas for newborns and babies wearing clothes up to a 12-month size. If you find something you love and need it in a different size (or larger size), reach out and let us know. Each design has been custom created and handmade featuring a variety of letting colors and styles. We have long and short sleeve baby bodysuits for boys and girls. You’ll find shiny glitter designs, metallic, holographic and more. We guaranty smiles and laughs as you browse through our collections. You won’t be able to resist buying more than one!